To the casual visitor, a look at this large brass, set in stone, would reveal nothing out of the ordinary (see Figures 1 and 31 [due to copyright restrictions, Figure 3 is only available in Creation magazine]). Figure 1 Bishop Bell's tomb shows the clear signs of heavy wear and tear after several centuries of shuffling feet. Skeletons of dinosaurs have been accurately reconstructed only in the past 100 years or so. Before this, scientists classifying these reptiles incorrectly pieced together their bones making the first artistic impressions wildly inaccurate. It seems highly improbable that an artist in the 15th century accurately portrayed a creature which he had never seen. Rather, it is more likely that these renditions were all creatures which had been observed. 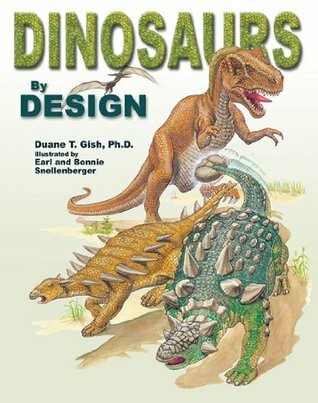 Clearly, the only reason modern researchers would fail to identify them as dinosaurs is their antibiblical bias that humans and dinosaurs did not co-exist. Click for larger view. But, on closer inspection, one can see engravings of creatures that any 21st century child would instantly recognize as dinosaurs! 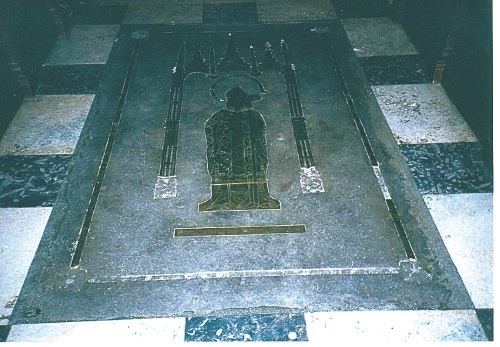 With the permission of the Canon Warden of the Cathedral,2 the carpet was removed so that I could take photographs. Born in 1410, Richard Bell entered monastic life at Durham at 16 years of age. He remained a monk for the next 50 years, during which he was ordained a priest and earned a degree at Oxford University. Following a period as Prior of Durham (1464–1478), he was promoted to the office of bishop at Carlisle in 1478. 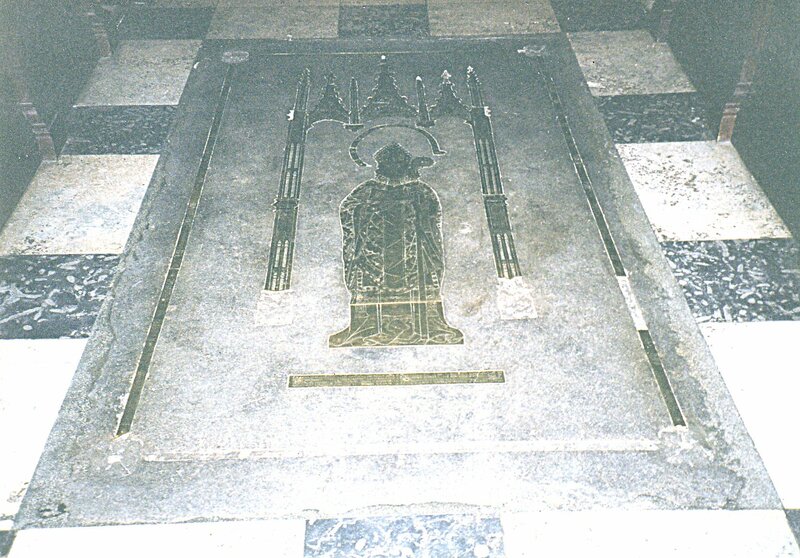 As a monk he was unable to make a will, but historians accept that he died in 1496, hence the date assigned to his tomb.5 The brass shows Bishop Richard Bell (1.44 m or 4 ft 8½ inches long) under a Gothic canopy (2.9 m or 9 ft 5 in long), dressed in his full vestments, with his mitre (bishop’s cap) and crosier (hooked staff). But it is the narrow brass fillet (2.9 m or 9½ ft long), running around the edge of the tomb, that contains the items of particular interest. Owing to the passage of time (and countless thousands of tramping feet!) parts of the fillet have long since been lost, including the entire bottom section. However, in between the words of the Latin inscription, there are depictions of various animals. Most of these are unremarkable—various fish, an eel, a dog, a pig, a bird, a weasel/stoat—but a few of the engravings depict unusual creatures. On one engraving the creatures have an unmistakable resemblance to certain dinosaurs. Yet how could that be, since the bishop’s tomb was sealed and decorated over three centuries before the fossil bones of such creatures were systematically dug up, described and named? But people puzzled over what creatures these early bones were from, some even entertaining the notion of giant people.8 Scientists have now described hundreds of ‘species’ of dinosaurs and have catalogued these into a number of distinct taxonomic groups. 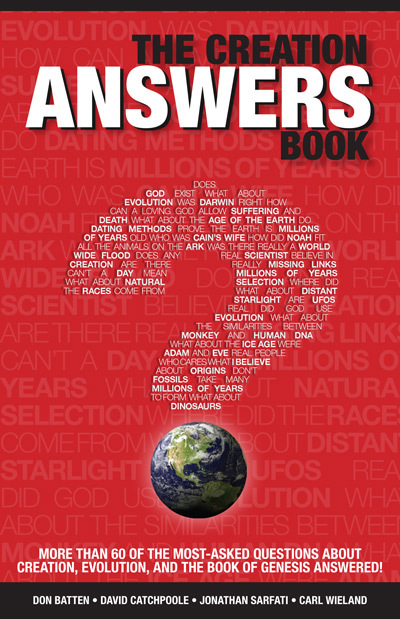 Accepting the Bible’s account of creation and earth history, these major groups descended from the original ‘kinds’ that God created on Day 6 (Genesis 1)—the same day that God created people. 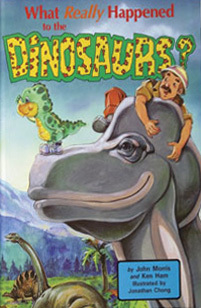 Noah later took pairs of each kind of land-dwelling, nostril-breathing creature onto the Ark, and this would have included representatives of each dinosaur kind (see Genesis 7:2, 8–9, 14–16).9 All people and land-based animals outside the Ark perished worldwide in the Great Flood (Genesis 7:19–23). Figure 4 This stunning image from Bishop Bell's tomb shows what appear to be dinosaurs. The image reveals the engravings in the brass fillet which any school child would innocently identify as well-known sauropod dinosaurs—those with long necks and tails. They appear to be engaged in a fight with their necks (as is also typical of giraffe behaviour) or perhaps courting displays, also familiar within the animal kingdom. Click for larger view. In the years following, descendants of the survivors on the Ark spread out across the globe, just as God had planned (Genesis 8:15–17). Although dinosaurs appear to be extinct today,10 it would not be very surprising if some kinds had survived until quite recently.11 If so, people would have witnessed them down through the centuries since the Flood and recorded their existence in literature and art. 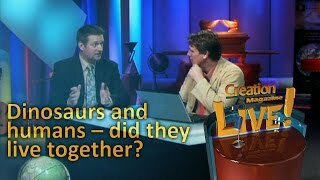 Today, due to the modern evolutionary belief that no dinosaurs survived beyond the so-called Cretaceous (an alleged 65 million years ago), most people disregard all of this evidence as mere myths and legends, while ignoring the clear teaching of the Bible. To the unprejudiced mind, however, Bishop Bell’s ‘brass behemoths’ suggest that at least some such creatures were alive and well in the Middle Ages. Figure 5 The image of some unusual type of creature not as readily identifiable, bearing similarity to the amphibian Eryops. Similarly, its tail is suspended, rather than lying on the ground as all but the most recent sauropod reconstructions incorrectly show.15 The left-hand creature sports appendages near the end of its tail that remind any dinosaur enthusiast of the spiked tail of Stegosaurus or perhaps the bony, clubbed tail of certain ankylosaurid dinosaurs such as Euoplocephalus. It is possible that both creatures had these tail appendages; the kink at the end of the tail of the right-hand animal might be all that remains, the details having long since worn away. This glimpse into the zoological world of the 15th century has another ring of truth about it. Today, males of some long-necked animals are observed to engage in tests of strength, to establish dominance and thereby access to breeding females. This engraving of two dinosaurs in ‘combat’ is certainly reminiscent of giraffes engaged in ‘necking’. 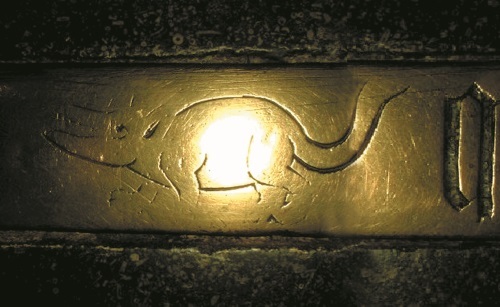 Another engraving on Bishop Bell’s tomb-brass (Figure 5) seems unlike any living animal. Sadly, it is very worn but we can discern a head and mouth of crocodile proportions. However, the legs are unlike those of a crocodilian and the animal seems more likely to be a now-extinct reptilian creature. 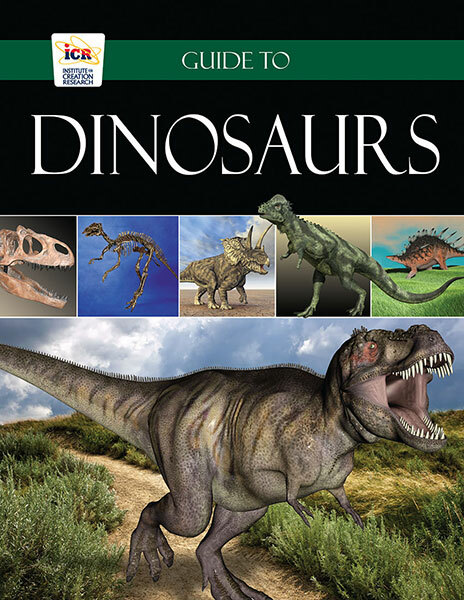 Of course, not everyone will be convinced that these beasts are indeed dinosaurs. Many people are so ‘evolutionized’16 that they feel compelled to explain away what they see as an anachronism. For example, the Canon Warden of Carlisle Cathedral wrote the following in a letter to David Jolly (USA): ‘These motifs include various sorts of vegetation, birds, dogs, fish, a bat, an eel and several mythical beasts. I do not think that the word “dinosaur” is appropriate in this context. The decoration is typical of the period, and is in no way unusual or unremarkable’ (emphasis added). 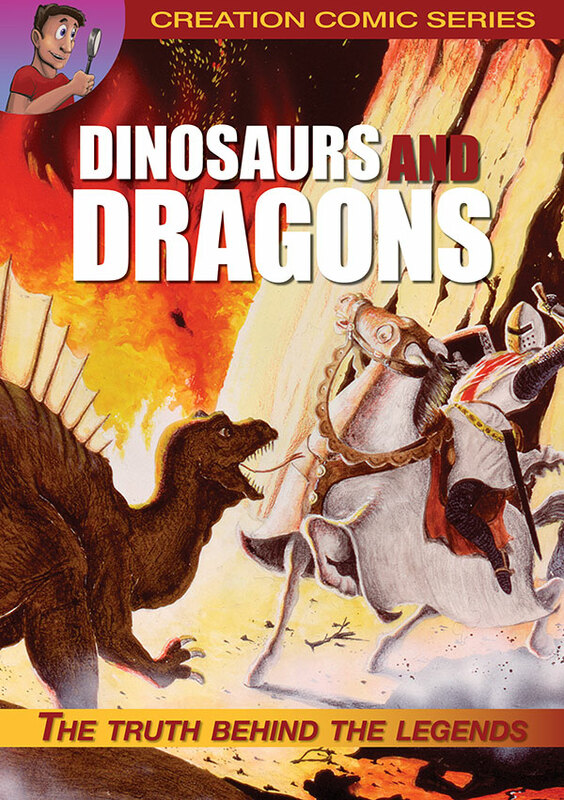 However, the existence of dinosaur motifs from this period presents no problem to the person who accepts what the Bible clearly implies—that people were once contemporary with dinosaurs. No doubt many would have us believe that the Renaissance artisan made up a beast that, by pure coincidence, just happens to look like a dinosaur. Unless this is an elaborate forgery17 (which is highly unlikely, considering its location! 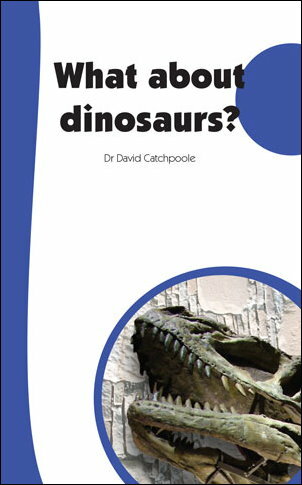 ), it represents further evidence that the standard evolutionary dogma concerning dinosaurs and their supposed 65-million-year-old extinction is just plain wrong. Can the Ica Stones be independently authenticated? Engraving/rubbing of the whole brass; Lack, W., Stuchfield, H.M. and Whittemore, P., The Monumental Brasses of Cumberland and Westmorland, London, Monumental Brass Society, p. 21, 1998. Return to text. Rev. Canon David W.V. Weston, Canon Warden & Canon Librarian. Letter dated 5 June 2002. Return to text. In fact, only a few years previously, the brass pieces had been professionally removed and reset because they were coming loose from the underlying stonework. Return to text. Canon Weston’s cooperation is much appreciated. He, in fact, does not share the view that the creatures are dinosaurs, as this article goes on to explain. However, he met me on my visit and provided me with some helpful documents about the tomb brasses and Bishop Bell himself. Return to text. Dobson, B., Richard Bell, prior of Durham (1464–78) and bishop of Carlisle (1478–95), in: Transactions of the Cumberland & Westmorland Antiquities & Archives Society 65:182–221, 1965. Return to text. Dr Owen (later Professor Sir Richard Owen) made this famous announcement at a meeting of the British Association for the Advancement of Science, on the basis of knowledge of fossil skeletons of Iguanodon, Megalosaurus and Hyaeosaurus. Return to text. Reverend Robert Plot was Professor of ‘Chymistry’ at Oxford University, and he identified the broken bone (from a limestone quarry in Oxfordshire) as part of a thigh bone. The specimen has since been lost but probably belonged to a Megalosaurus dinosaur. See: Benton, M.J., The Penguin Historical Atlas of the Dinosaurs, Penguin Books Ltd., London, p. 12, 1996. Return to text. Charig, A., A New Look at the Dinosaurs, British Museum (Natural History), London, p. 45, 1985. Return to text. Ham, K., The Great Dinosaur Mystery Solved! 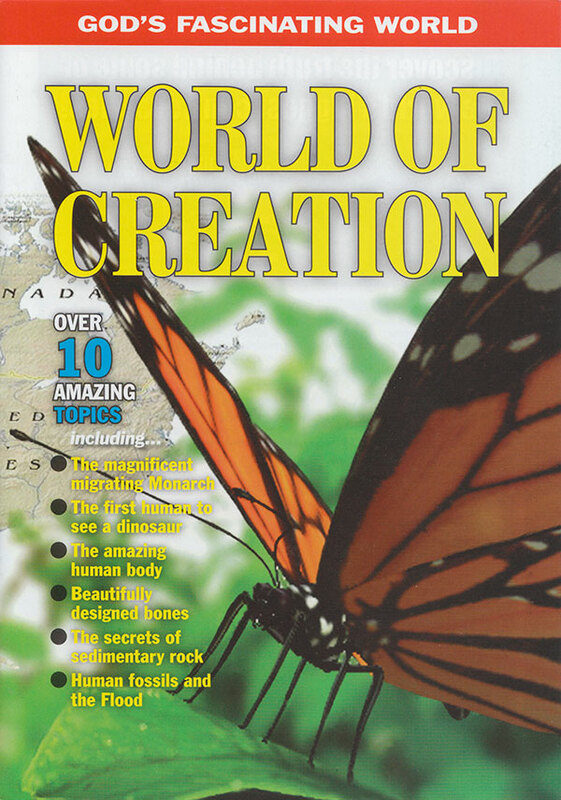 A biblical view of these amazing creatures, Master Books, Arkansas, 1998. Return to text. 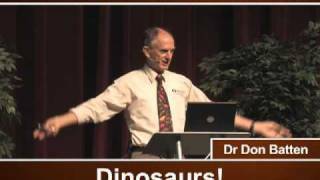 Dinosaur extinction is no great mystery if we start with Scripture; see ref. 9, pp. 11–17. Also, Ham, K., What really happened to the dinosaurs?, 2001. Return to text. It is possible that some dinosaurs, thought to be long extinct by the scientific community, will be found still inhabiting remote parts of the earth. See: Woetzel, D., Behemoth or bust: an expedition into Cameroon investigating reports of a Sauropod dinosaur, J. Creation 15(2):62–68, 2001. Return to text. In many instances the context unarguably demonstrates that these were real, albeit unusual, creatures and that these biblical writers were familiar with them. See ref. 9, pp. 33–52. Return to text. 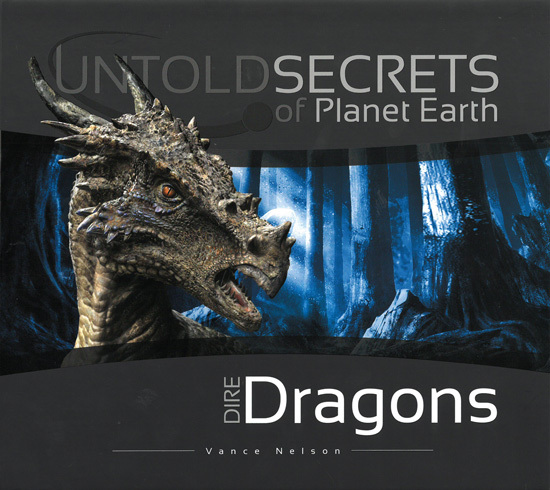 See, for example: ‘Dragon’ fossils seized, Creation 17(4):9, 1995; Alferov, T., Dragons: animals … not apparitions, Creation 22(3):14–16, 2000; Johnson, B., Thunderbirds: Did the American Indians see ‘winged dinosaurs’? Creation 24(2):28–32, 2002. Return to text. 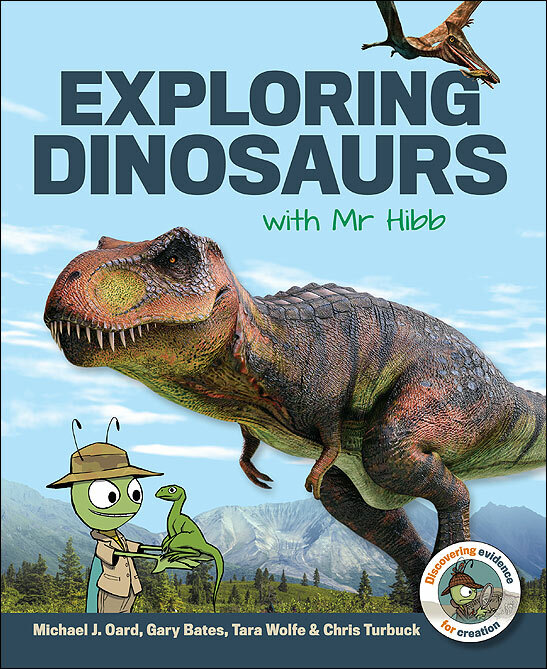 See ‘Towering’ dinosaurs … a tall story? 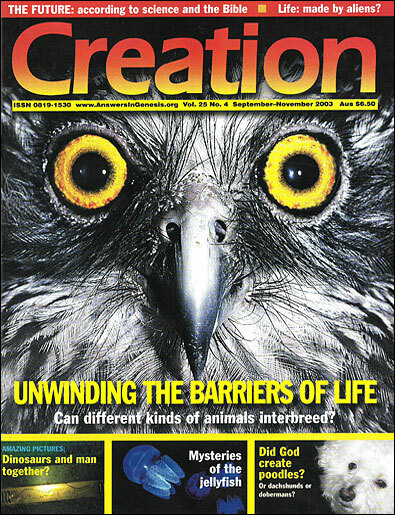 Creation 21(4):8, 1999; commentary on a report in Science. Return to text. 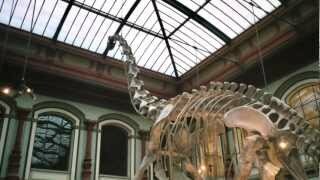 For instance, several years ago, the British Museum of Natural History repositioned the tail of the Diplodocus skeleton in its main gallery to reflect the new thinking. Also, the sauropod dinosaurs that have featured in the BBC/Discovery Walking with dinosaurs programs, have all been shown with this cantilever posture. Return to text. That is, the ‘facts’ of evolution and millions of years of earth history are so ingrained in their minds that evidence that should cause them to question their worldview is simply reinterpreted to fit into it! Return to text. Unfortunately, some initially plausible evidences for man’s contemporaneity with dinosaurs have later turned out to be mistaken. The controversial ‘Ica stones’—allegedly genuine pre-Inca engravings of dinosaurs from Peru—have since been shown to be a fraud. Creation 24(2) featured these with the cautionary label, ‘Too good to be true?’ In fact, it turns out that an unscrupulous Peruvian surgeon had purchased the stones from a local artist and installed them in his museum, claiming them to be ancient artefacts; the artist himself makes these stones for tourists and never claims them to be ancient. The Institute of Geological Sciences in London has since examined one of the stones and confirmed its modern origin. The fraud was exposed on a Nova television documentary in 2002, entitled ‘The Case of the Ancient Astronauts’. [Ed. note Dec. 2003: Footnote 17 of this article declared the Ica stones to be definitely fraudulent and a person associated with them (now deceased) as ‘unscrupulous’. However, as some reminded us, and we accept, this is an inappropriately sweeping judgment to make merely because one or a few were carved modern day hoaxes. While we would not advise using them as an apologetic evidence until the matter is fully investigated in the creationist technical literature, we apologize unreservedly for any distress caused by this footnote. (Creation 26(1):5) ] Return to text.